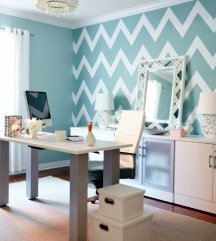 When it comes to painting stripes on walls, vertical or horizontal patterns are not your only options. In fact, the decorative effects you can achieve when you combine latex paint and painter's tape are limited only by your imagination! 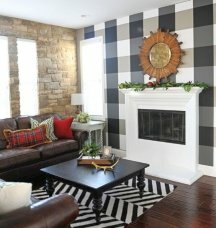 The following ideas and real life examples of painting stripes on walls are not a complete list of striping techniques, but they should be enough to open your mind to different possibilities and try something new, or maybe even create your own stripe combination. 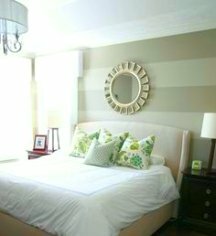 Vertical paint stripes are the most popular pattern - so much so that they are usually what comes to mind first when we think about painting stripes on walls. When done in the right size and colors, vertical stripes can visually elongate the walls, so this is the type to use whenever you need to create an illusion of higher ceilings. Regular, 2-color patterns in subdued tones are a classic look, but you can funk things up by using multiple colors and stripe sizes. Horizontal paint stripes make a room seem more expansive - similar to how a sweater with horizontal stripes makes a person appear broader. You can use this effect to your advantage in small, shoe-box sized rooms, or to correct the shape of a disproportionally oblong room (by striping just 1 or 2 walls). But remember that horizontal bands look rather casual, and so may not be appropriate for traditional formal settings, or period decors. Diagonal paint stripes look most at home in contemporary decors. Because they create an illusion of movement (due to their diagonal direction), these stripes are best reserved for painting small surfaces such as accent walls, floors or furniture. In fact, the effect of diagonal stripes is so powerful, they can actually make you feel dizzy and disoriented if used in a highly contrasting color combination, and on all the walls in a room (not to mention the crazy aesthetic effect this will create). Criss-cross stripe combinations involve using sheer colored glazes, and overlaying vertical and horizontal stripes to create various looks. These can range from simple symmetrical stripe intersections to complex plaid designs done in different stripe sizes, and from monochrome to multiple color combinations. Color blocking and checker patterns look very similar but use a different taping and painting method (more advanced and time-consuming). 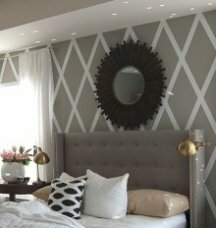 Painted wall pinstripes can be created by using a paint comb, a specially cut squeegee tool, or just regular painter's tape. The dragging tools will produce the thinnest pinstripes (and very dense, if done with a comb), while the size of taped pinstripes will depend on the width of the tape you used. Basketweave patterns result from intersecting pinstripes (which may look more like texture than stripes when densely combed). Grid designs can look like squares and rectangles when taped off at right angles, or like diamonds when done in a diagonal direction. The basic technique is pretty simple - after laying out and taping the grid lines, you simply paint over everything with a different color (the color of the grid lines comes from the base coat). The harlequin pattern looks similar to diamonds but is a more involved technique that requires repositioning the tape several times during the process. Zigzag and Chevron designs are the most advanced stripe patterns of all - certainly not for beginners. Even "simple" 2-color symmetrical combinations take at least 3 times as long to plan, measure, outline and paint as most other stripe types (and even longer for irregular or multi-color zigzag patterns). But the end result is impressive indeed! However, if you lack the patience and attention to detail needed for such an involved painting project, you might be better off just installing a wallpaper mural. 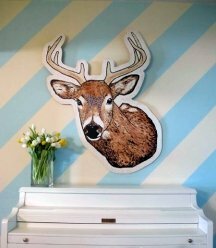 Decorative handpainted stripes can be done freehand, with stencils, or by combining both painting methods - wall stripes just don't get more unique and custom than that! This option is the ultimate when it comes to adding personality and individuality to a room (your imagination is the only limit here), but it's definitely not for the timid - you've got to have guts to do something so unconventional in your home. Just remember that while the self-expression part is great when painting stripes on walls freehand, making your art actually work with the rest of the decor is what separates a stylish home design from a teenager's room. 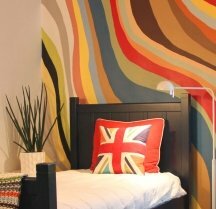 Here are some more creative stripe painting ideas to inspire you - they've been submitted by our site visitors just like you, so take a look and don't forget to leave a comment! And if you have your own paint striping project to share, click here and see your name in lights.